"Emily & Meritt bring a unique design sensibility to Pottery Barn that our customers love"
SAN FRANCISCO--(BUSINESS WIRE)--Pottery Barn, a member of the Williams-Sonoma, Inc. (NYSE: WSM) portfolio of brands, debuted a charming new assortment of home décor and entertaining essentials with celebrated stylists and designers, Emily Current and Meritt Elliott. The new Emily & Meritt for Pottery Barn collection captures the playfulness of spring with a fresh color palette, graphic stripes, delicate florals, and fanciful bunny accents, reflecting Emily & Meritt’s signature design sensibility – a whimsical, timeless take on classic Americana design. The latest chapter in the Emily & Meritt for Pottery Barn story offers a selection of pieces perfect for a spring brunch or an easy spring bedroom update. 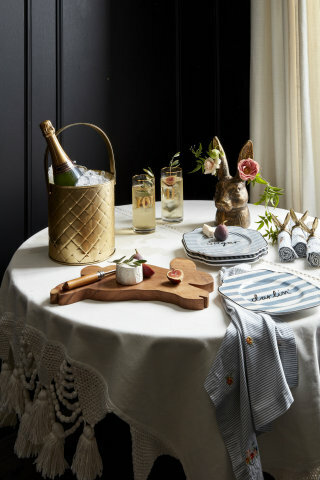 Host a champagne brunch with the Quilted Champagne Bucket and You & Me Mimosa Glasses, paired with whimsical bunny accents including the acacia Bunny Cheese Board and Bunny Vase that holds colorful blooms or branches within its ears. Striped napkins embroidered with delicate flowers are a cheerful addition to the table, especially when paired with the Bunny Ear Napkin Rings. Spring is around the corner, and the new bedding collection is inspired by the promise of warmer days ahead. Create a layered bed that mixes soft black washed cotton duvets and shams with the light blue and white Patchwork Striped Quilt and cozy Garden Stripe Comforter featuring a whimsical stipe and floral print. Add texture with decorative pillows in soft chambray and luxurious Mongolian faux fur and decorate the room with playful accents including the Bunny Ring Holder and Bunny Bookends. "We were so excited to design a springtime entertaining story and bedroom, a collection that nods to classic American charm, with a smattering of nostalgic floral prints and embroidery, vintage brass and touches of whimsy and edge,” said Emily Current and Meritt Elliott. “The soft layers of stripes are inspired by loved and worn denim, pops of colorful flowers feel optimistically like vintage Victorian, and washed black textiles add in a rough and tumble modernity that offers a beautiful balance and irony. 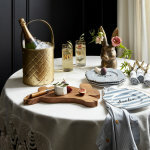 Inspired by traditional springtime icons and creatures, our tablescape is a mash up of sweet charm, humor and new takes on nostalgic tradition- from bunny serving boards to brass baskets." The Emily & Meritt for Pottery Barn Spring 2019 collection is now available online at PotteryBarn.com. To learn more about the line, visit www.potterybarn.com/emilyandmeritt and join the conversation on social media with @potterybarn #EandMxPB. Emily Current and Meritt Elliott, a creative team since 1999, are the celebrated Los Angeles-based duo known for their whimsical and timeless sensibility that recalls classic Americana. Drawn to one another’s innate sense of style, Emily and Meritt first met in college and quickly realized the fresh and fearless aesthetic they share – an affinity for individuality, dressing without rules and mixing high and low with confidence and flair. In Spring 2012, the twosome joined an elite rank of designers when they became members of the prestigious Council of Fashion Designers of America (CFDA). In a visual ode to their varied career, encapsulating their love affair with denim and imaginative worldview, Emily and Meritt penned A Denim Story: Inspirations from Bell-bottoms to Boyfriends, a coffee table book published by Rizzoli in Spring 2014. In Spring 2015, Emily and Meritt launched their much anticipated, multi-category women’s collection, aptly named THE GREAT. Whether they’re designing a collection, creating memorable outfits for clients, styling unforgettable editorial spreads and advertising campaigns, appearing as fashion experts, or consulting for companies inspired by their distinct world-view, Emily and Meritt always bring a playful, intelligent spirit to whatever they touch. For more information on Emily Current and Meritt Elliott, please visit www.thisisemilyandmeritt.com or email Ashley@thisisemilyandmeritt.com. Pottery Barn, a member of the Williams-Sonoma, Inc. (NYSE: WSM) portfolio of brands, is a premier specialty retailer for casual, comfortable and stylish home furnishings. Key product categories include furniture, bedding, bath, rugs, window treatments, tabletop, lighting and decorative accessories. Nearly all Pottery Barn products are designed in-house and are exclusive to its catalogs, stores and website. Pottery Barn operates company-owned stores in the United States, Canada and Australia and has unaffiliated franchisees that operate stores in the Middle East, the Philippines and South Korea, and stores and ecommerce websites in Mexico, as well as an ecommerce site at www.potterybarn.com that offers international shipping to customers worldwide. Pottery Barn provides complimentary design services and a comprehensive gift registry program for weddings and other special events. 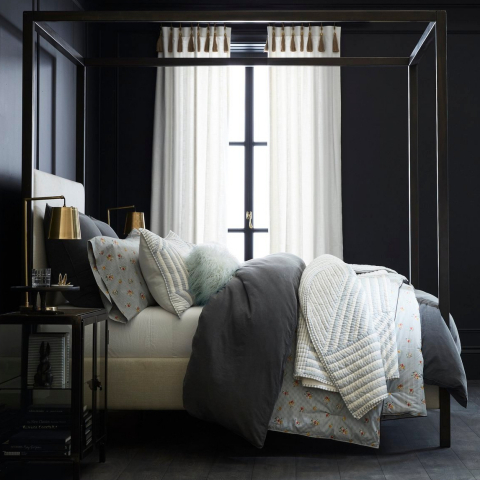 Pottery Barn now offers products for all life stages and every room in the home through Pottery Barn, Pottery Barn Bed and Bath, Pottery Barn Kids, and PBteen. Pottery Barn is also part of The Key Rewards, a free-to-join loyalty program that offers members exclusive benefits across the Williams-Sonoma family of brands. The company is headquartered in San Francisco, California.